It’s hard to believe it’s been five years. I remember hearing late in the evening on May 2, 2009 that Jack Kemp had passed away. I was out of town that weekend. On Monday, May 4, I awoke to hear Bill Bennett Mornings playing loud and clear on my radio. I listened to guest after guest join Mr. Bennett to pay tribute to Jack Kemp as the week began. I was still somewhat groggy when Congressman Paul Ryan was on the show to remember Jack Kemp. I can remember that interview like it was yesterday. I remember Bill Bennett pointing out that Jack Kemp would note that Adam Smith wrote The Wealth of Nations, not The Poverty of Nations. Kemp wanted the focus to be on what worked, not on what failed. Solutions oriented folks operate that way. 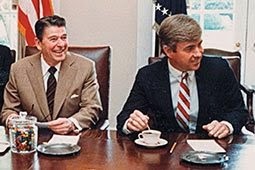 Jack Kemp has been in my thoughts a lot lately. As I have gotten a little older and have started to realize that in politics many of the arguments never find resolution, I have been looking closely at some of the work Kemp did to improve the lives of the less fortunate. Jack Kemp was compassionate, a bleeding heart conservative, and this may have been his greatest gift. Kemp was able to apply a humanitarian view to many of the problems that ailed society simply by showing up. Kemp spent countless hours in places modern Republicans rarely tread. Kemp believed in the American Dream, the belief that in America, every single person had the capacity to reach for the stars, and get there, if they simply wanted it and worked toward it. Kemp wanted a level playing field, rather than viewing America as red or blue and taking a “every man for himself” approach, Kemp wanted to make sure that being trapped was an option, not a predetermination. I’ve written recently about Congressman Paul Ryan and Robert Woodson, founder of the Center for Neighborhood Enterprise. I won’t rehash that work here, you can read it on your own if you like, but it’s worth noting that Bob Woodson worked closely with Kemp, and in turn some twenty years later is working with Congressman Ryan as they both look to address some of the same issues on which Kemp had begun to work. Kemp is no longer with us, but that certainly does not mean his work does not continue. Finally, Jack Kemp wanted economic growth. Serious, unlimited, no-holds-barred, through-the-roof, economic growth. He figured cutting taxes would spur entrepreneurs and development. Sure, he wasn’t as worried about the deficit side of things, the logic of the day was, if you cut taxes and more people went to work, there would be more people paying in to the government till, and deficits would go down just by their nature. And we have to remember, Jack Kemp helped introduce tax cuts to the Republican platform, tax cuts were not always part of the Republican mantra. If you read a little history from the late 1970’s, you’ll see that Ronald Reagan and Jack Kemp had some pretty fierce arguments about tax cuts. Kemp ultimately won the debate, Reagan adopted Kemponomics as Reaganomics, and the 1980’s saw a great economic recovery. The rest is history. Anyway, on the five year anniversary of Jack Kemp’s passing, I wanted to add my two cents. It may be closer to fifteen cents, and you loyalists will get that and laugh. It’s a hodgepodge of thoughts, but that’s rather the point.